Dan Spangler’s Fusor from Makezine.com. (There’s a lot of greeting verbiage on this page? Did you find this site after reading this article in Make Magazine? Or maybe you saw this article at Instructables.com? Maybe you’ve heard that “fusion is the energy of the future and always will be.” We are here to dispel that notion. And to affirm that meaningful scientific discovery is not the exclusive province of large-scale institutional laboratories or corporations. To the contrary, some of the most important advances in history have emerged on the periphery of scientific enterprise – and then had to fight their way in to the center. We actually think that a path (if not the path) to practical fusion energy was found more than 50 years ago, but that for whatever reason that path got lost. The contributors to Fusor.net are exploring a line of investigation first introduced by Philo T. Farnsworth in the 1950s and 60s. If the name “Philo T. Farnsworth” is not familiar to you, it should be. In 1921, Farnsworth struck on a idea for bouncing electrons back and forth in a vacuum tube, which idea paved the way for electronic television. Arguably, the screen you are looking at now can trace its origins back to a sketch that Farnsworth’s drew for his high school science teacher in 1922. In the last years of his life, during the zenith of what was then known as “The Atomic Age,” Farnsworth turned his genius to the riddle of nuclear fusion: how do you bottle a star? What sort of container can you create that harness the most primal forces of the Universe without the container either extinguishing the star or being destroyed by it. There is no question but that Philo Farnsworth found a novel, simple, and elegant solution to that riddle and demonstrated it in the 1960s – FIFTY YEARS AGO. Whether or not that approach will ever lead to a practical source of useful energy – i.e. an electrical generator – remains unanswered. We are here to find the trail and follow in the footsteps of Philo T. Farnsworth . That said, please indulge us in a few observations about that Make Magazine article. When the Make article says the device it describes “generates only insignificant quantities of fusion…” they’re actually overstating the case more than slightly. The fact of the matter is that the device shown in Make won’t do ANY actual nuclear fusion. 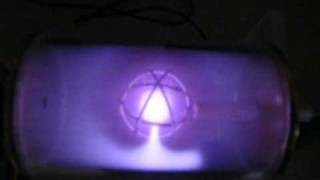 The device in the Make article is what we call a “demo fusor.” It is called a “demo fusor” because it demonstrates the conditions under which fusion can be achieved. But it takes a not only a different sort of reactor, the addition of some actual fusion fuel – and, more notably, a very high level of skill in a variety of sciences – to produce the actual “star in a jar” that the article touts. 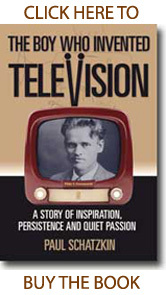 Read “The Boy Who Invented Television” to learn more about where this technology came from and its direct connection to the most ubiquitous appliance o the planet. The world is taking a new and popular interest in the subject to the point that it is finally starting to attract tech mogul and VC money. It’s a hot topic (pun intended). * The expression ‘Star In A Jar’ was first coined in 1975 by the founder and host of this site. That would be me.